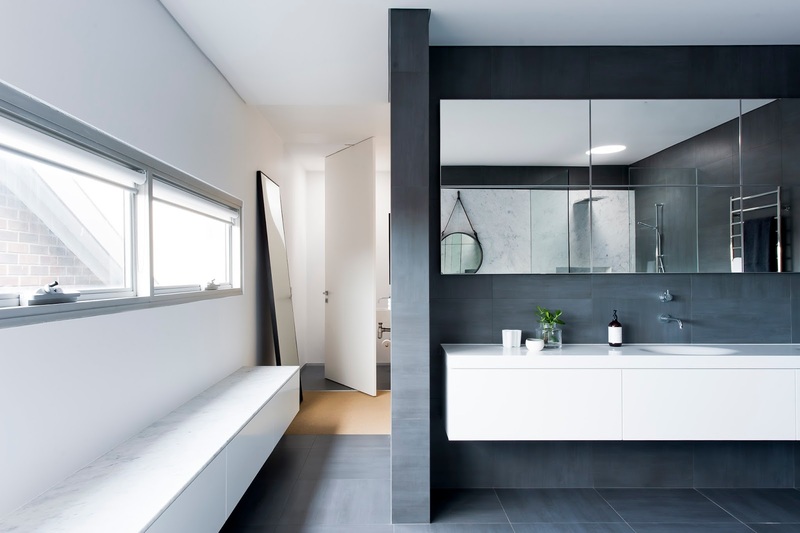 Minosa: Understated elegance creates a stunning bathroom. A traditional, four bedroom, freestanding Californian Bungalow house situated in the Sydney’s beachside suburb of Coogee. With a traditional restored frontage and architecturally designed minimal modern extension, this home sure surprised. Its occupants also melded two worlds. The professional couple combined has 5 children between them aged between 10 and 18 - a true Brady bunch. With both parents appreciating modern design, the brief was very focused on modern living. Working in an award winning design firm herself, our client had a very astute eye for quality design and construction. · Clients varying body heights. He was TALL she was short… tough! Very rarely are we presented with a space that is free from anything, a space that is square with good light, a clean slate. This space was a dream to work with, but it still had its challenges. 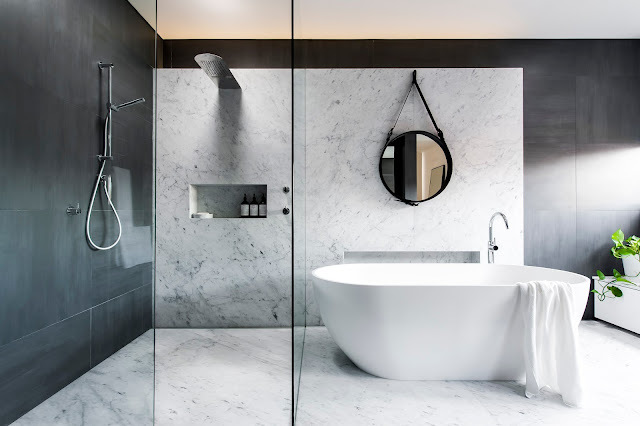 The client worked for an award winning interior design studio and had a real eye for detail and a desire for something remarkable, a place to relax & rejuvenate - the challenge was set. 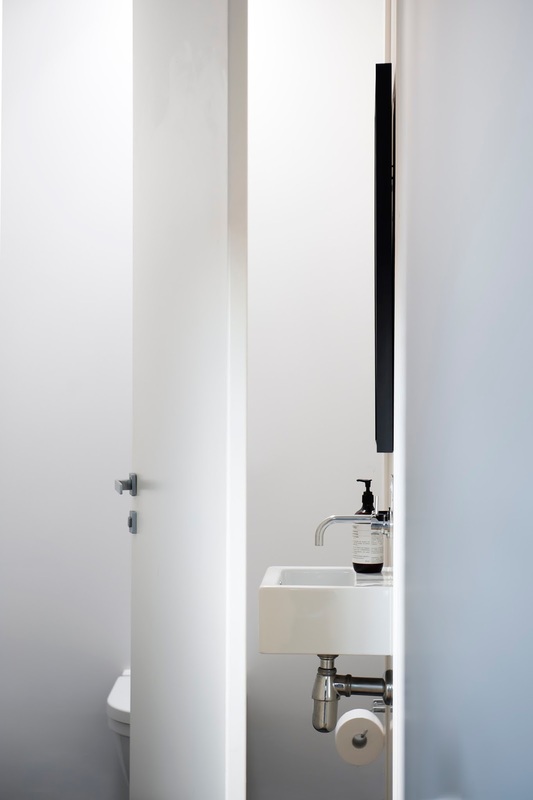 The approach to the room was to zone the functions, the toilet is in a separate area tucked away from the bathing space so the room was setout into three zones, bathing, vanity and hamper storage come seating area. 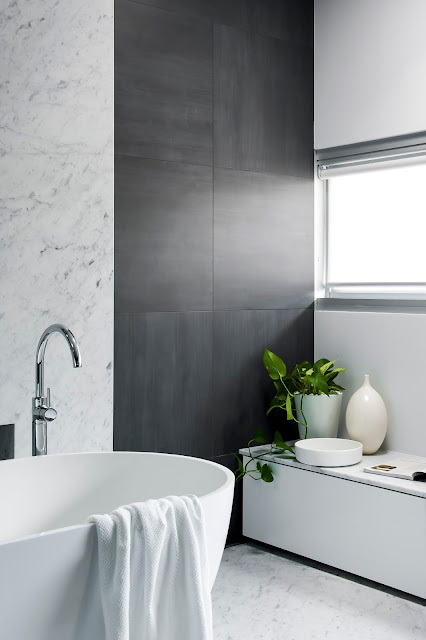 The clients wish for a monochromatic space drove selections, with a dark grey 600 x 600 tile selected early in the design process the designer needed to introduce a natural element to help warm the space up - Carrera Mable was selected to play to the monochromatic pallet. With materials and spatial plan created, form & function began to take shape. The designer chose to create a real sense of arrival as the entry point to this new bathing space was thru the wardrobe. The creation of a low long hamper area for the extra towels, dirty clothes and winter blankets with a marble top is a real prelude to what is coming, this hamper was also designed at seat height so it could be a place of conversation as well as a practical storage solution. 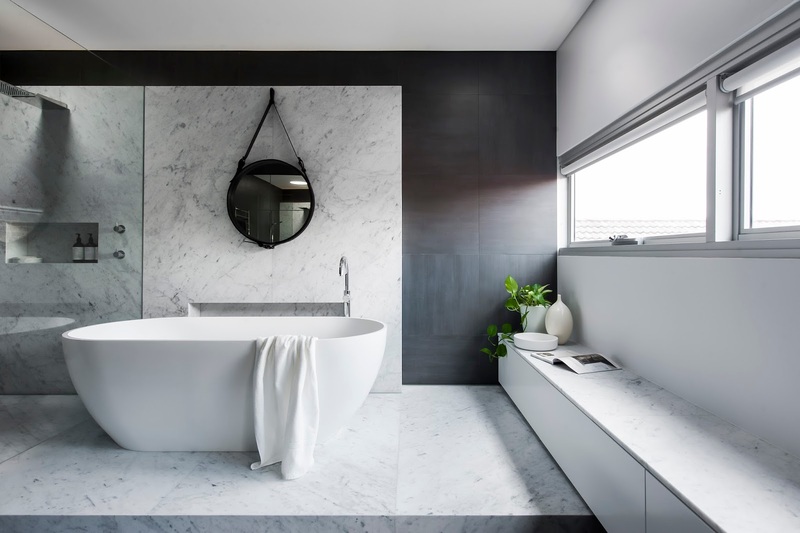 With the clients desire for something striking the designer chose to create a strong statement to the bathing section of this Parents Retreat, a raised platform for the bathing zone was created, this platform was raised & clad with Carrera marble. 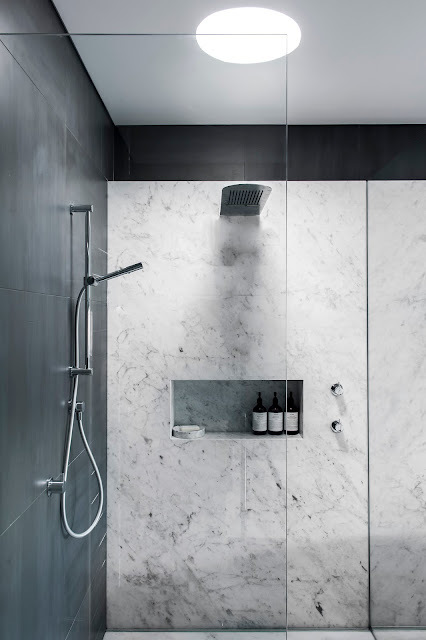 The platform was created to deal with the change of material, the designer chose to extenuate this change of material by mitring the edges of the marble and creating a block like feel to the floor and back wall. 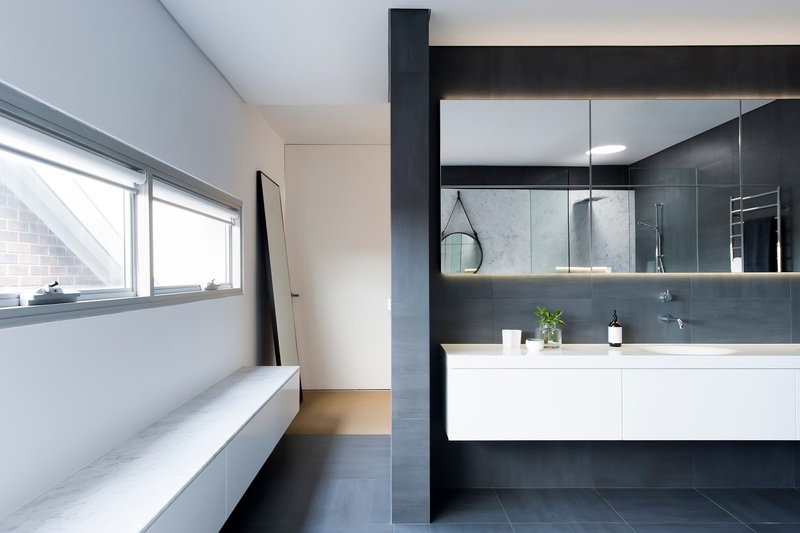 By building up the back wall it allowed the designer to create recessed niches to place the day-to-day cleansing products and also house accent and room lighting. The raised step also accommodated the night-light, which was sensor activated. 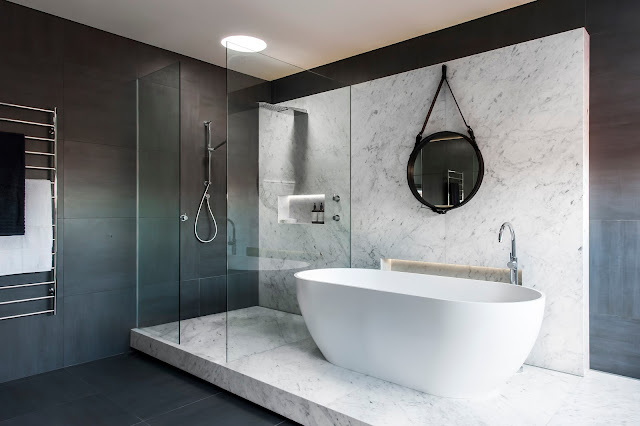 There was a clear decision to separate the bathing to one side and the vanity area to the other, the space to a certain degree dictated this as did the clients desire to have a very oversized bench and integrated wash basins. 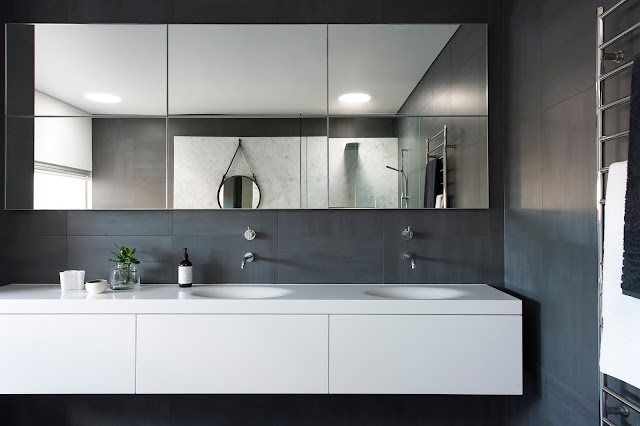 The washbasin is hand made for this site and is made from a single piece of Solid Surface material with two eco friendly bowls slumped out of the top surface. Above the washbasin is touch to open bifold lift up doors that cater for more than ample personal effect storage whilst the servo drives drawers below house cleaning products and more towels. The bifold lift up doors create a very dynamic storage area, taking the doors away from face and allowing perfect access to all personal effect. Adjustable mirrors are installed inside for shaving and close facial activities. The lighting of the space is very measured and layered, the design has the ability to be up in the morning or when the need to dress up and it has the ability to mood down so you can rejuvenate and relax in the space when needed, accent lighting is run thru the niches and under the step and vanity unit to add depth to the dark spots of the space; making the space feel larger. 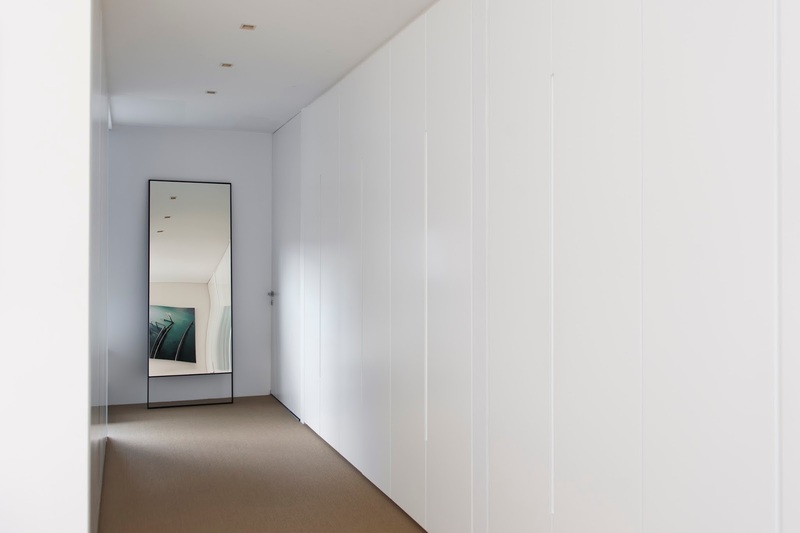 The task lighting over the vanity is controlled thru wide 24degree LED downlights; there was no need for perfect facial illumination as the designer had created a make up area inside one of the adjoining wardrobe modules. 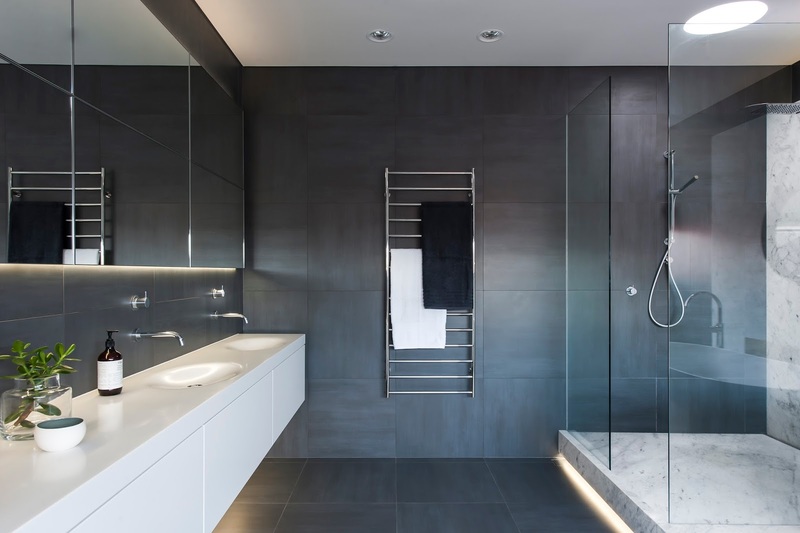 The room light comes via the LED up lighting, at 14.4 watt per LM running above the marble wall and also above the recessed mirror cabinets we supply all the general room light required, we also have dim control to these so the mood can be brought right down when needed. To match all this rejuvenation and wellness lighting the designer chose to specify the Gessi 3mm shower head, not only does this look sharp but it has two other roles, yes it is a rain soaker and secondly it has a built in waterfall to offer the user a large amount of water when ever required. 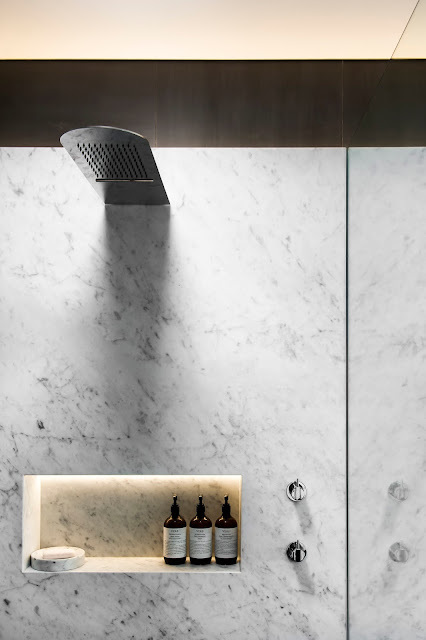 Also specified was an adjustable shower rail for complete flexibility. 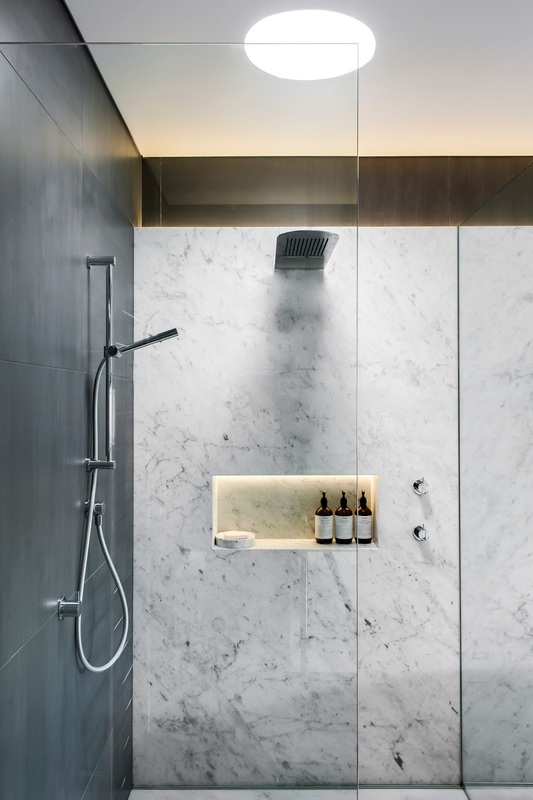 Two round sky tubes plaster set above the shower and to the side of the bath where created to bathe the space with more natural light, this also offers glimpses to the sky to increase the feeling of space. This round element picks up the selected tapware and the classic Gubi leather clad mirror centred over the freestanding bath. 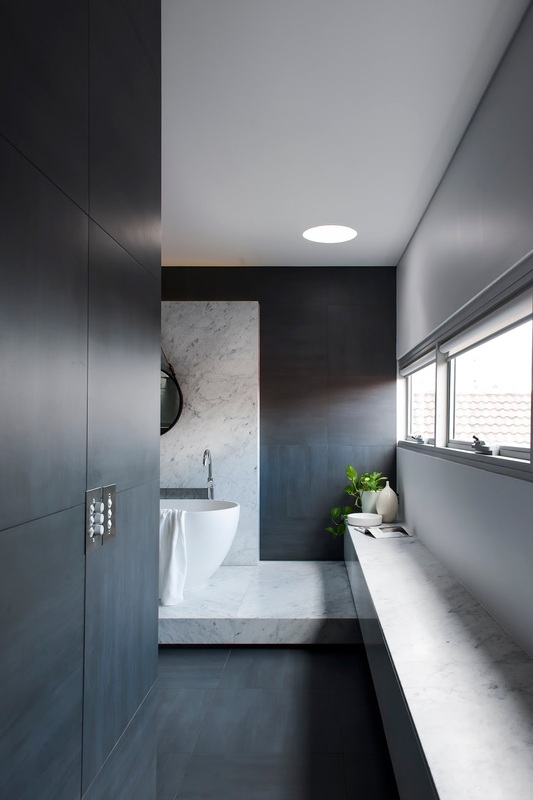 The round forms help to soften this monochromatic & edgy space. 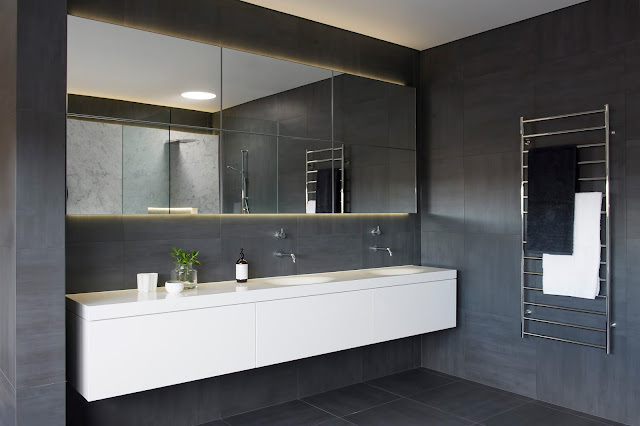 Over all the clean simple module styled design is a modern triumph, the space is well balanced, has many features that come together to make one stunning bathing space – the perfect space to unwind or start up…..